The Syrian army has reportedly launched a fresh assault on militant groups in a spate of neighborhoods of the northern city of Aleppo, killing scores of terrorists. Dozens of militants were killed and many more wounded after the Syrian Army and the country's National Defense Forces (NDF) launched a new offensive in at least five neighborhoods of the northern city of Aleppo, according to the Iranian news agency FARS. "The militant groups' strongholds in the neighborhoods of al-Lairamoun, Bustan al-Basha, the Old City, al-Jaberiyeh and al-Sheikh Saeed came under attacks of the Syrian Army, which not only left tens of the militants killed or wounded but destroyed their military hardware," FARS quoted the army sources as saying. The sources added that "scores of the militants were also killed or wounded in the army's offensive near the village of al-Mansoura in the western countryside of Aleppo city." 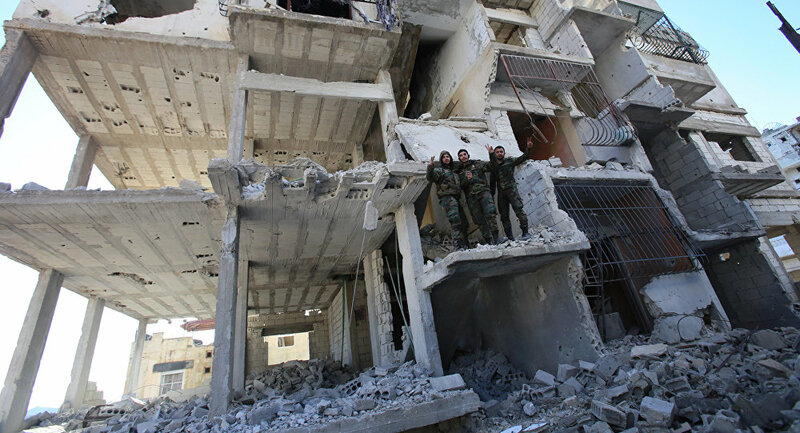 In the past few weeks, Syrian forces have intensified their attacks on the militants' strongholds in different districts of the city of Aleppo, where the army was successful in pinning terrorists down behind their defensive lines. In a separate development on Tuesday, the Syrian troops and the NDF targeted militants' strongholds across Aleppo province, including those located near the northeastern town of Tadif. The fighting reportedly left several terrorists dead and some more wounded. The new offensives came a day after the army and the NDF managed to drive Daesh militants out of more areas in the eastern Syrian province of Deir Ezzor, regaining control of several strategic heights there, sources said. Adding to the army's anti-Daesh effort is Russia's ongoing air campaign in Syria, which was launched on September 30, when more than fifty Russian warplanes, including Su-24M, Su-25 and Su-34 jets, commenced precision airstrikes on Daesh and al-Nusra Front targets at the behest of Syrian President Bashar Assad.